This band is designed for both Fitbit Alta and Fitbit Alta HR. Stainless steel mesh band design keeps ventilated, never remain sweaty. A strong magnetic closure ensures secure lock and convenient adjustment according to the circumstance of the individual wrist. Perfect fit with top stainless steel clasp for Fitbit Alta HR and Alta. Large: 6.7"-8.1" Small: 5.5"-6.7"
Secure lock: precision metal connector fit seamlessly onto your Fitbit interface and interlock design of durable connectors lock the Fitbit device firmly and stably. 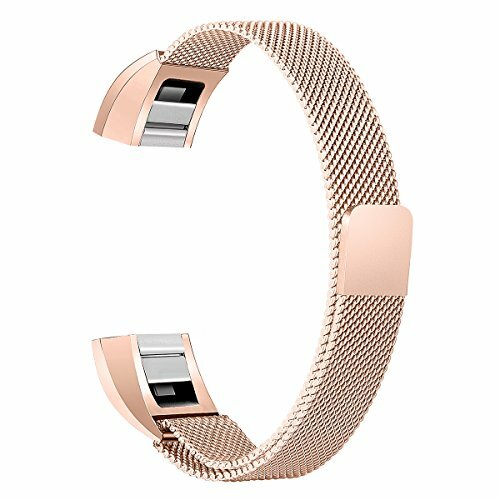 Fully magnetic clasp: the strong magnet holds the band tightly, convenient to adjust the length of the band to fit your wrist perfectly. There is no worry about too loose or tight fit with one extra link added or not. Smooth and flexible stainless steel mesh wraps around your wrist comfortably, enable your skin to breathe and ultra-slim straps make the band incredibly lightweight, free your work and exercise. 1 year Warranty. Order with confidence with a 1 year warranty for replacement or full refund without return the item.